A recipe for a fresh, fragrant Middle-Eastern-flavoured dish that’s perfect for summer, plus a bit of background on how food got mixed up in my fiction. Some of my strongest memories from novels are those involving food, perhaps because it engages the senses so fully. I can still almost taste the toffee shocks in Enid Blyton’s Magic Faraway Tree, which swelled as you chewed until you couldn’t speak, and finally exploded in your mouth. Later, while studying French at university, I discovered Marcel Proust’s Remembrance of Things Past, and experienced the magical moment when the protagonist dips a petite madeleine in his tea and is suffused with happy memories from his childhood. But my love affair with food in literature truly began with Laura Esquivel’s Like Water for Chocolate, a wonderful novel, integrating recipes, in which food plays a crucial role in the forbidden love affair between the central characters, Tita and Pedro, serving as a silent means of communication between the two. Although not consciously, this memory might have inspired the inclusion of a rose-flavoured quail dish in my own novel, which has 30 recipes included at the end. 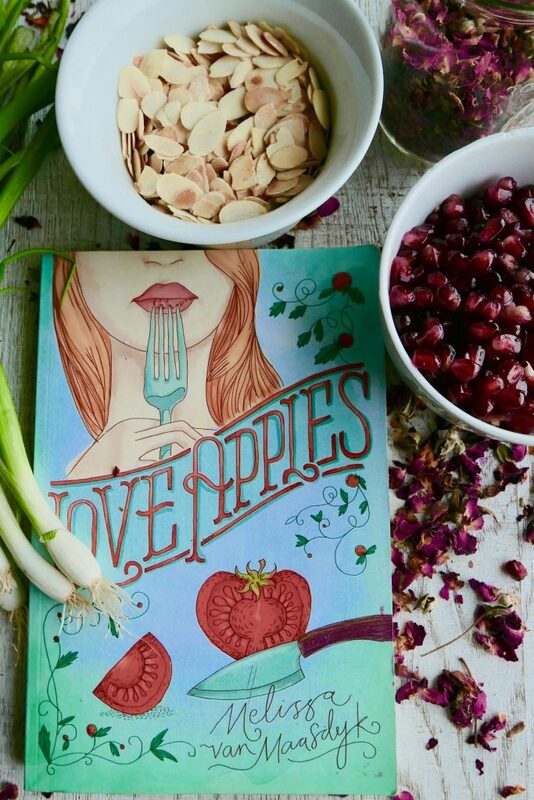 Love Apples actually started out as a straightforward contemporary romance sans recipes but since food is one of my great loves – nurtured in my mother’s kitchen and honed as a food and travel writer for magazines – it found its way into every corner of my fictional prose too. And so when I presented sample pages to a creative writing class in New York, it was suggested that I add recipes to the novel so that people could satisfy the very real hunger that the descriptions of food elicited. If perhaps inspired by Esquivel’s Mexican take on quails, however, this dish also draws on my current surroundings in the Middle East, where I’ve lived for over a decade (first in Bahrain and now Abu Dhabi), and where roses and quails have been used in cooking since ancient times. A fragrant memory of quails sautéed in pomegranate sauce that I once savoured at a Lebanese restaurant certainly played a part in my marinade. 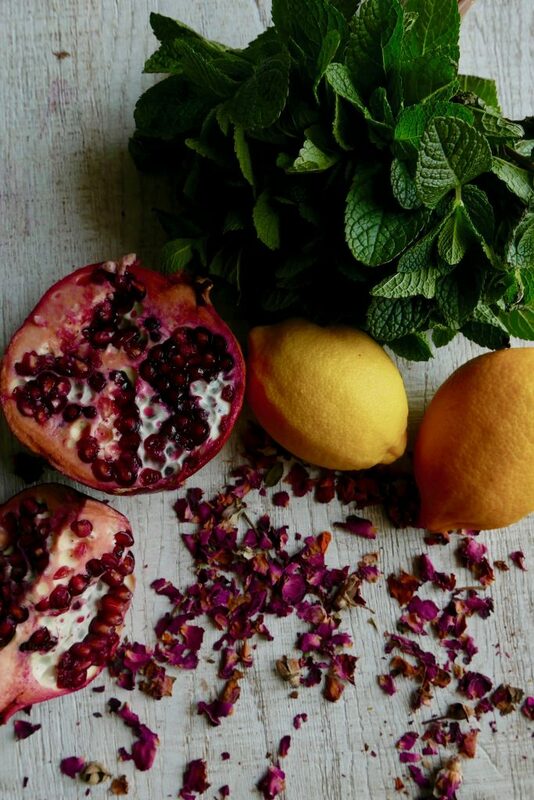 In addition to rose water, this includes pomegranate molasses plus ground coriander and cumin, two spices widely used in regional dishes such as the GCC’s aromatic rice dish machbous – a result of being located on the ancient spice route between the Indus Valley and Mesopotamia. As an accompaniment to the quails, the cool pomegranate and toasted-almond salad, below, works well since the juicy pomegranate seeds marry happily with the molasses in the sauce, while the mint and coriander are a fresh complement to the spices. Pretty in pink with its sprinkling of jewel-like seeds, the salad is also delicious on its own for a light lunch, as demonstrated in its appearance in online mag The Pool, accessible via this link. For something a little more substantial, I also sometimes top the salad with grilled halloumi cheese, and I often serve it as an accompaniment to barbecues, when it works particularly well with minty lamb chops. However you choose to mix things up, I hope you enjoy this summer-loving dish. Bon appetit! To butterfly the quails, use kitchen scissors to snip along either side of the backbone of each, from top to bottom, and then remove the bone along with the neck. Open them out, and press down to flatten. You might like to ask your butcher to do this for you. Grate the onion into a medium-sized bowl. Add remaining marinade ingredients, and stir to combine. Pour the marinade into a flat dish that’s big enough to take all the quails. Place quails in the marinade, rub the marinade all over them, and let them sit for 1–2 hours. Place quails under a preheated grill, breasts down, and grill for 7 minutes. Turn over and grill for 7–10 minutes or until browned and cooked through. 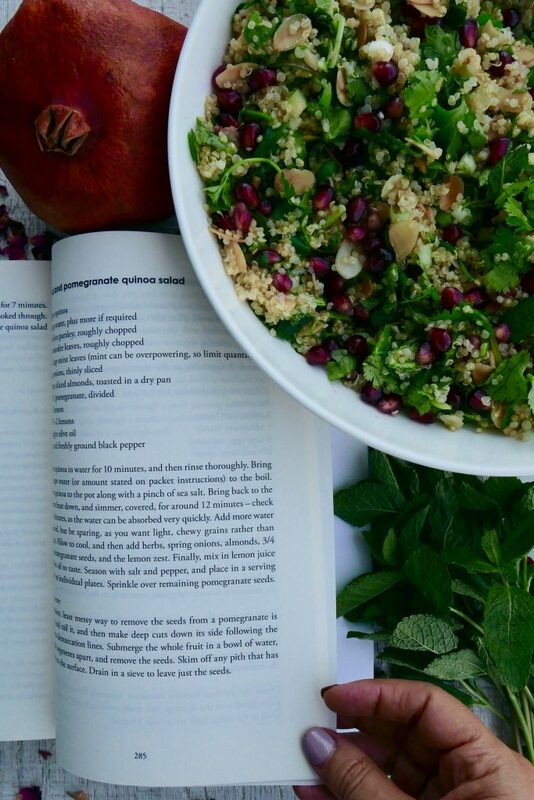 Serve alongside a mound of herby almond and pomegranate quinoa salad sprinkled with rose petals. Soak the quinoa in water for 10 minutes, and then rinse thoroughly. Bring 2 1/2 cups water (or amount stated on packet instructions) to the boil. Add the quinoa to the pot along with a pinch of sea salt. Bring back to the boil, turn heat down, and simmer, covered, for around 12 minutes – check after 7 minutes, as the water can be absorbed very quickly. Add more water if required, but be sparing, as you want light, chewy grains rather than porridge. Allow to cool, and then add herbs, spring onions, almonds, 3/4 of the pomegranate seeds, and the lemon zest. Finally, mix in lemon juice and olive oil to taste. Season with salt and pepper, and place in a serving dish or on individual plates. Sprinkle over remaining pomegranate seeds. The easiest, least messy way to remove the seeds from a pomegranate is to top and tail it, and then make deep cuts down its side following the segment-demarcation lines. Submerge the whole fruit in a bowl of water, pull the segments apart, and remove the seeds. Skim off any pith that has floated to the surface. Drain in a sieve to leave just the seeds. 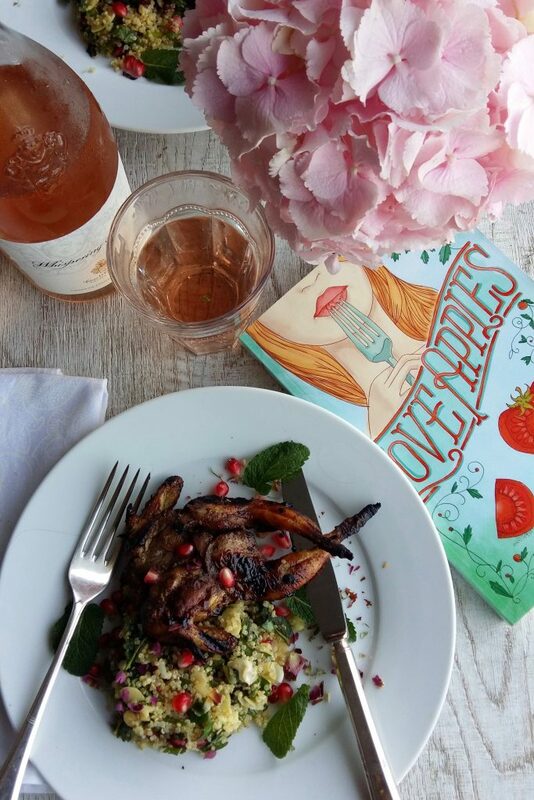 I confess the thought of cooking quail makes me quake – it just seems like a delicacy that is beyond my mediocre culinary reach, but without doubt the pomegranate almond and quinoa salad can surely make its way into my limited repertoire. 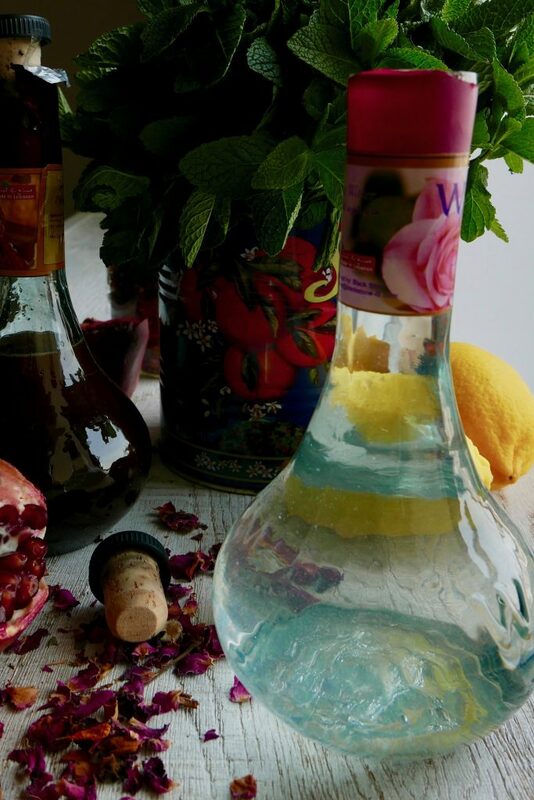 The thought of a rose infused syrup is one I can’t get out of my mind even if I am too wimpy to attempt it. Somehow the recipe stirs up thoughts of a favourite fragrance and a beautiful vase combined into a mouthwatering morsel, maybe I’ll try it when I grow up. Until then I’ll reread the book and wallow in the plot details that lea duo to this sensory feast.